Barfey | I'm not stalking you. Barfey. Other kids have a teddy bear. I have Barfey. He started off as a little white stuffed dog with brown ears from the Hallmark store in the mall, made by R. Dakin. My mom said she named him after one of the dogs in the Family Circus cartoon strip. My mom bought him for me so long ago that I can’t remember. Barfey was just always there, for as long as I can remember. I loved him so much he became tattered and dirty. And of course my mom, being the woman she is, resolved this by buying me a replacement Barfey–AND THROWING OUT THE ORIGINAL. She snuffed out a young stuffed animal’s life, just as it was beginning. I was so young that I didn’t know enough to protest. And while the second Barfey was the same dog made by the same company from the same store in the same mall, this one had a brown body and white ears! Leave it to my mom to not even bother to color match. 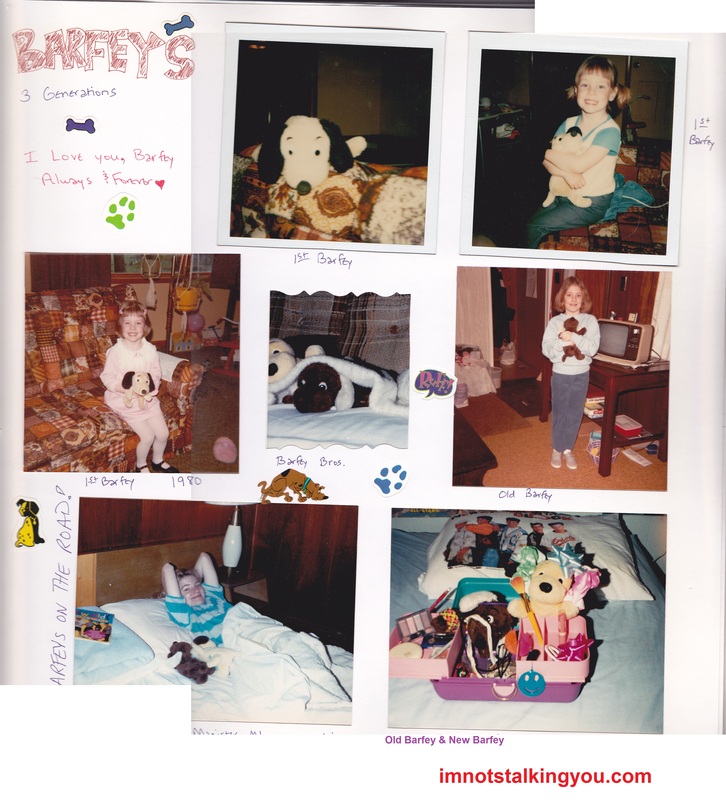 Barfey was my favorite stuffed animal. I slept with him every night. If we went on a trip, he went with us. There used to be a show on Saturday mornings called ABC Weekend Special. They showed family cartoons and movies. One of my favorites was a cartoon of The Velveteen Rabbit, based on the book by Margery Williams, from 1985, made by Hanna-Barbara. (One of my other favorites was a mini-series called Cougar–I actually managed to find that on DVD!) It always made me think of Barfey. That maybe he loved me as much as I loved him. 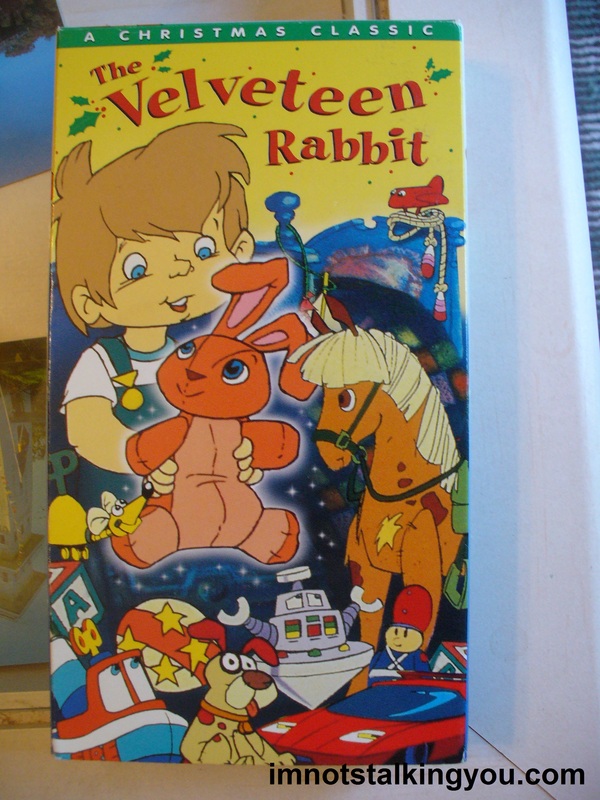 That maybe he too was on a quest to be real, as was The Velveteen Rabbit. Rocking Horse: Real isn’t how you’re made. It is a thing that happens to you. Love makes you real. When a child loves you for a long, long time, not just to play with, but really loves you, then you become real. Once you are real, you can’t become unreal again. It lasts for always. You can’t be unreal again. Bunny-Rabbit: Oh, I want very much to be real. I also imagined that the stress that Barfey went through as I slept with him at night and tossed and turned was probably similar to the torture that The Velveteen Rabbit endured as well. Bunny-Rabbit: Look out, you’re flattening me. Ouch, I’m not a football. Easy now, don’t move. Ooo-ooo. When I was in fourth grade, I got the Chicken Pox. I was scared because I didn’t really know what that meant. (And they proved to be quite uncomfortable.) I clutched Barfey tightly for comfort during this uncertain time, as my mom called her nurse friend for information. Something occurred to me while she was on the phone, and it scared me more than being sick. Thinking back to The Velveteen Rabbit and the rabbit’s fate after Robert’s sickness, I asked my mom if Barfey was going to have to be burned since I was holding him and I was sick. She laughed at me and told me “no”. I was relieved. And pissed that she would find my question amusing. But New Barfey was not an adequate replacement. Not only because he lacked memories, but also nutshells. He was young and bounced out of bed too easily. New Barfey always struck me more as a stuffed animal, rather than the “real” aura that Old Barfey had. You looked into Old Barfey’s eyes, and he talked to you. Or, at least, to me. Once I moved out on my own, I developed a fear (remember, I love to worry) of losing my Barfeys, such as in a fire or tornado or volcanic eruption. When I discovered Ebay, I found people who had Barfeys to sell. They were easier to locate when I discovered that his Dakin birth name was “Drooper”. (What a bad name!) I even ordered a few use Barfeys to have as spares. But they are not the same. There experiences were with other children. They are packed away in a drawer upstairs, while my Barfeys have a revered position of honor in my bedroom, on a high shelf, well out of reach of dogs and toddlers. Although, I did finally get a baby “Drooper” that I always wanted and my mother would never buy me. Yes, the design was so popular they even made mini ones. 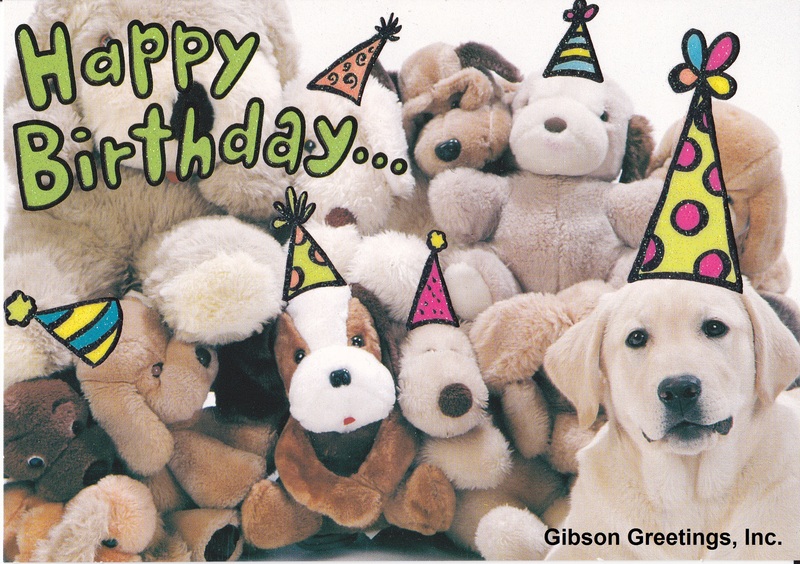 Barfey is so popular, he was on a greeting card (see far left). Gibson Greetings, Inc.
At the same time I was trying to find a way to keep Barfey with me forever, I was also trying to figure out what tattoo I could get that I would never get tired of. (Do you see where this is going?) 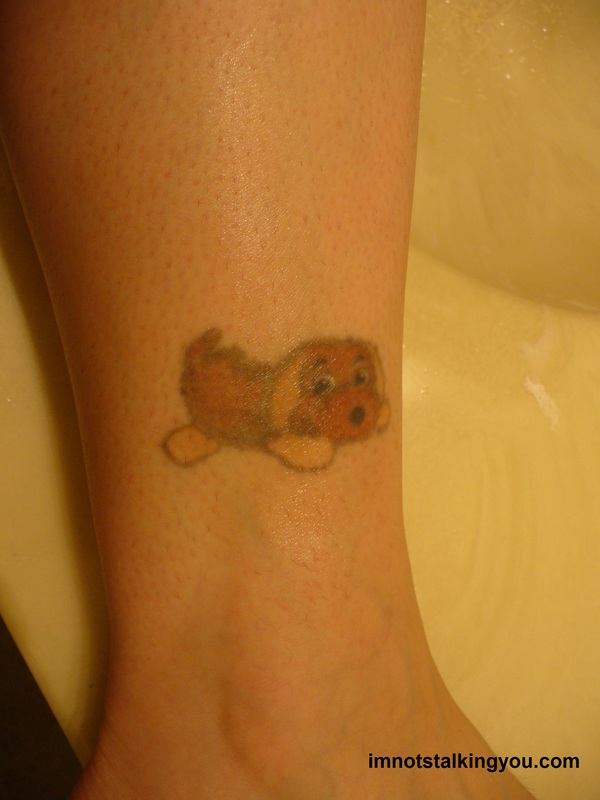 So, shortly after my 30th birthday, I had Barfey tattooed on my ankle. I wanted him to look furry and cartoony. I think it turned out wonderful. As I continued to age, I felt bad that Barfey had no children in his life anymore. My green-haired friend’s niece, who was fond of me and I of her, gave me a friendship necklace. I put it on Old Barfey, to keep him connected to the wonderful childhood spirit. But, alas, she has now grown to adulthood herself. Robert: [to Nanny] He isn’t a toy. He’s real. Bunny-Rabbit: I’m real. I’m real! I have never outgrown stuffed animals (that will be a future post). I still find comfort in stroking Old Barfey’s nappy fur and feeling his nose gently rock back and forth. And he probably looks a fright to anyone but me. But I have given him so much loving, that to me, he is REAL. Like The Velveteen Rabbit. Nursery Magic Fairy: I watch over all the toys who are worn out from too much loving. I will take you away and make you real. Bunny-Rabbit: But I am real. Nursery Magic Fairy: You were real only to the boy. Now you shall be real to everyone. Fun Trivia Fact: Barfey co-starred in the 1978 movie Long Journey Back with Stephanie Zimbalist. Posted in Childhood Reminiscing, Entertainment Worship & Review and tagged ABC Weekend Special, Barfey, Barfy, bear, Chicken Pox, childhood, Cougar, Dakin, Drooper, Ebay, Family Circus, Hallmark, Hanna-Barbara, love, plush, real, stuffed animal, teddy, toy, Velveteen Rabbit. Bookmark the permalink. I loved this post about all your Barfeys! It brought tears to my eyes. The Velveteen Rabbit is such a classic… so perfectly says it all about beloved stuffed animals. And we must be sharing a brain frequency… because this morning I began a future post about trying to decide on a tattoo! Thanks for stopping by. The Velveteen Rabbit always makes me cry. 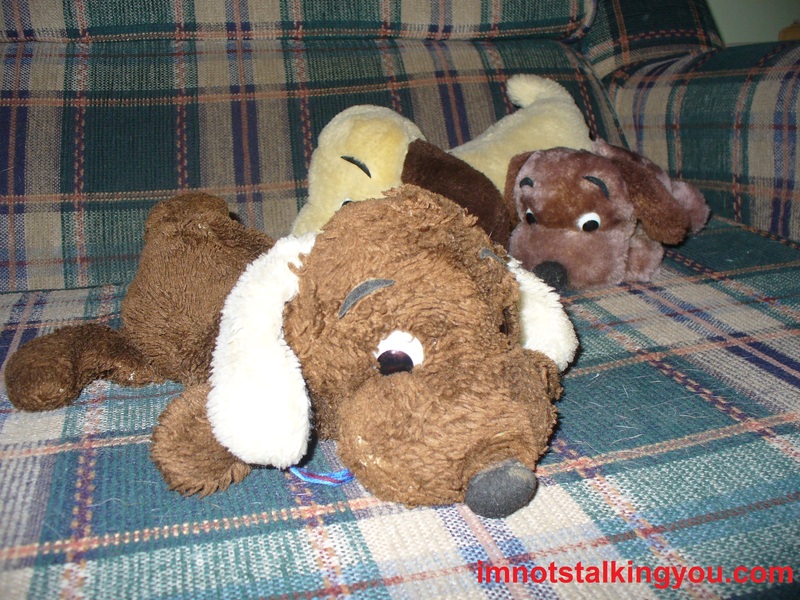 Pingback: Sleeps With Stuffed Animals « I'm not stalking you. Pingback: Give The Perfect Gift « I'm not stalking you. Pingback: Foto Phriday | I'm not stalking you. Pingback: Angry Macey Official Book Teaser Trailer | I'm not stalking you.